A few weeks after its official launch, The Bentway – Toronto’s newest urban park, under a major downtown highway no less – is thriving. The Bentway is part of the High Line Network, a series of major projects around North America transforming underutilized infrastructure into new urban landscapes like parks, public squares, open-air museums, botanical gardens, transit corridors, walkways and more. Torontonians, take pride: of the 19 projects, The Bentway has been one of the fastest projects, a credit to CEO Julian Sleath and his team, and to Judy and Wilmot Matthews, whose financial sponsorship was contingent upon action, decisiveness and cooperation. Recently on a frigid night (this winter’s recurring theme) I had a chance to visit with The Bentway’s Director of Programming Ilana Altman and Director of Development, Dave Carey. Our tour began at The Bentway Skate Trail. Notwithstanding the cold, the elegantly curving ice path, designed by Public Work and Ken Greenberg, was being enjoyed by hardy skaters, while onlookers warmed themselves at the fire stations and wrapped themselves in cozy Bentway blankets. Currently 220m long, ultimately the path will reach Bathurst St. for a total of 800m. On Monday nights they offer free skate rentals and pop-up lessons (6 – 7 pm for 6 – 12 year olds; 7 – 8 pm for ages 12+), and Friday nights feature a skating dance party. Apparently the path can be used for skating up to 12C, so there are likely many months left for you to enjoy it. Public art is a major focus of The Bentway. 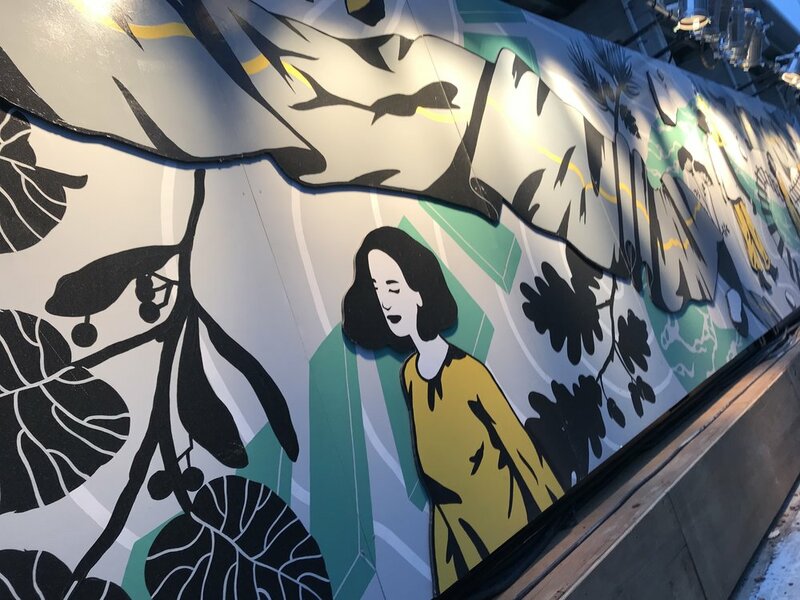 In winter, spring/summer and fall, The Bentway will feature temporary art exhibitions: each season will support a unique exhibition and include both local and international artists. For the inaugural exhibition, Constructions of the Everyday, the artists were challenged to find new value in the mundane, in different if not utilitarian materials, using The Bentway not only as site but also as subject. The first piece we saw was Re-Route, a mural by Jennifer Ilett celebrating the different routes that have made their way over the neighbourhood’s land - water, rail and roadway – and how they have intersected over time, while the mural’s human figures establish the neighbourhood as a destination, not just a pass-through. The final and most ephemeral piece is Shadow! by Toronto-based art and design collective Public Visualization Studio (PVS). Not only does it cast onto the concrete columns via spotlights silhouettes of real-time skaters, the skaters’ shadows interplay with pre-recorded shadows of other skaters, including some wonderful “ice-breaking” skating by the Toronto Ice Skate Group. PVS spent two weeks recording over 200 skaters at Nathan Phillips Square, recording those skaters who wore dark clothes against the white ice. They then re-drew thousands of frames of recording. The effort paid off – it’s magical. Between the skating, art and a schedule of programming, you now have an excuse to throw on your parka and toque and get out of your home this winter. And don’t be concerned about highway noise: the traffic is five storeys above, so it’s surprisingly and pleasantly quiet. The only real noise you’ll hear is the zamboni cleaning the ice or the occasional canon from Fort York.